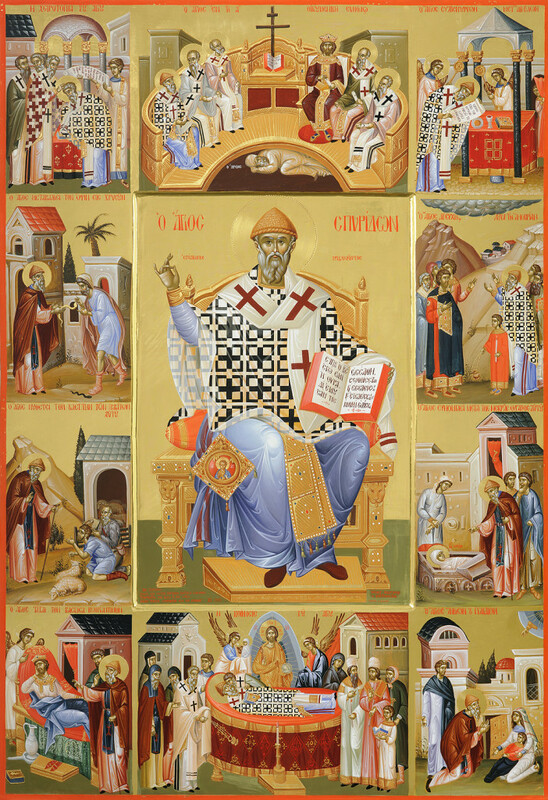 Let us examine closely, O blessed Christians, Saint Spyridon's wondrous works; for they are indeed beneficial to the soul and its development, as are the accounts of the lives of all men of God. They enable us not only to avoid vice, but also to advance in virtue. It stands to reason that those who pay attention to these divine acts and supernatural feats, improve their lives, shunning their former vices in pursuit of virtue, becoming more ardent in its performance, each motivated according to his strength, striving to imitate their example. All the biographies of the saints are admirable and edifying to the soul. However, the life and miracles of Saint Spyridon are more inspiring and pleasant to the ear, stimulating both the mind and heart. This life therefore, of our great Father and his awe-inspiring miracles we shall narrate for your love, and we beg all to attend with eagerness and contrition. In the days of old, the island of Kerkyra was stricken by a severe famine and many necessities of life were lacking. On Great Saturday, Saint Spyridon appeared to the captains of certain nearby ships and informed them of the serious need, and they brought wheat to the island. Therefore, the Holy Pascha was celebrated on the previously famished island with great splendor and joy with the provisions accorded by the Saint. At another time, a plague swept the city of Kerkyra, and everyone whether stricken or not, flocked to the shrine of Saint Spyridon for there was grave concern that the entire city would fall victim. Yet, many of the pious people were not affected in the least, and straightway, by the Saint's intercession, health and prosperity were restored to the island. Furthermore, Saint Spyridon restored eyesight to two disabled oarsmen of the Venetian fleet who had been discharged from the ships of Antonio Bernardo and Jerome Mauricano. Few were those who were not astonished by this miracle which the blessed one did for those pious men, who, out of religious zeal climbed to the top of the belfry at the Saint's Church to extinguish a fire that had been started by lightning. When the whole edifice was about to go up in flames, the men fell from the heights, but were not hurt as they landed safely. Once, a certain nobleman mocked a young lad to scorn who was afflicted with an incurable illness. While the boy lay on the road during a procession, so that the relics of the Saint might pass over him, in hope of getting a cure, the nobleman also ridiculed his parents, who wept by the side of the child. Yet divine retribution intervened, smiting the foolish one. At that moment, he was struck by a pyrotechnical device which completely burnt out his right eye. Many people were witness to this incident. Thereafter, he repented in tears and stood in the Church of Saint Spyridon throughout the night, praying for forgiveness. In the year of our Lord, 1673, a deadly blight descended and spread over fields and crops in the cities and countryside. Death seemed inescapable. Twice during that year, the wonderworking Spyridon saved the island and its inhabitants from certain ruin. In the year 1769, he cured a paralyzed German soldier who had approached him with faith and fervent tears and then fell at his feet. The governor of the island, Andrea Doni, witnessed the reaction of the crowds and the bell-ringing declaring this extraordinary miracle. He summoned physicians from the city's hospitals and was apprised thereby of the soldier's condition. At once, they marched to Saint Spyridon's Church where they chanted hymns of thanksgiving to him. Saint Spyridon was always the protector of Kerkyra, indeed a help in every circumstance. At the close of 1855, the public acclaimed his fatherly care which preserved the people from the threat of cholera which periodically menaced Europe, decimating heavily populated areas; for medical assistance was unable to stem the catastrophic results. In October of 1855, when cholera swept Europe, the first cases suddenly appeared in the Manduke quarter. The news struck fear in the towns and rural areas as everyone became alarmed. Each family considered it wise to prepare for mourning and a mass burial. The public unanimously chose to take refuge in the Church of Saint Spyridon for vespers. They called upon him with tears and prostrations during three consecutive vesper services offered up to God and His Saint. Whereupon, by his intercessions before God, Kerkyra did not fall victim to the same calamity that had visited other cities. In them the number of fatalities exceeded the tens of thousands. It became apparent that the Saint protected the island by the events of the first Sunday of November, when many people assembled as a procession of his relics was taking place. Then certain ones, namely physicians, feared that with the great concentration of people, the epidemic would spread rapidly. No one in the crowd however shared this fear as they set all their hopes on our Saint. Indeed, on that day, the entire populace including the outlying areas, gathered in the city. The two populations, both urban and rural, filled the square through which the holy relics were to pass. 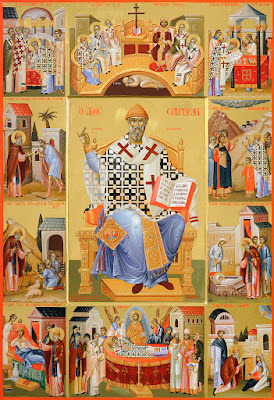 The clergy served a supplicatory canon and prayer to the wonderworking Spyridon, and with tears and prostrations they appealed to him to intercede before God. Great contrition seized the multitudes and it was an astonishing sight to observe the devotion and faith that people displayed for Saint Spyridon. Wondrous is God in His saints! From that day onward, the decline in the number of victims was noticed, and the report of deaths ceased. Divine wrath and the epidemic receded as the cholera disappeared in the face of the great intercession of the Saint. After the 11 of December, there were no more fatalities. It is impossible to describe the gratitude that the people showed for Saint Spyridon. The Bishop at that time, Athanasius, composed a service of thanksgiving to the Lord and ordered that it be chanted in all the churches of that diocese.